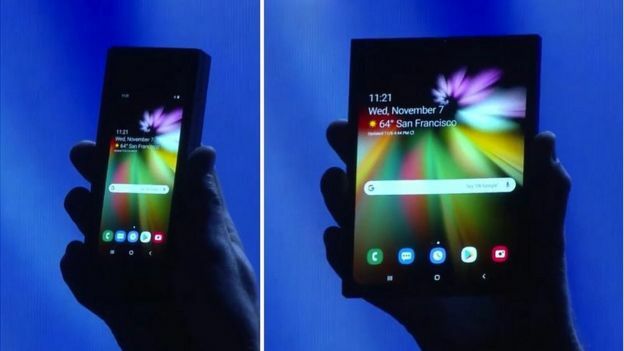 Well, after many years of incredible rumours, speculations and exaggerations, Samsung has finally revealed its own foldable phone…well, not fully. What is rather disappointing is that Samsung was not the first, hard as they tried to. They came second to a Chinese company called Royole, which produced its own kind of foldable device named FlexPai which in all honesty is quite difficult to fold. We just hope Samsung would produce better. According to pictures we were able to get from Annual Developer Conference held in San Francisco, the Infinity Flex Display is 7.3 inches when unfolded and can support up to three apps running at once. Also, its own folding pattern is quite different from that of the FlexPai. Its own expandable screen is on the inside while that of the FlexPai foldable screen is on the exterior. When folded, you can use a second smaller screen. Samsung also says you would be able to switch seamlessly between both screens while running an app by just opening or closing the device. Samsung is yet to reveal much details about the device including the name, specs, price or even a clear image of the device, but we have a feeling it would be launched sometime in 2019. Spacefinish is Bringing Office Spaces of the Future to Africa. 2019 will be one mad tech year though! In all ramifications of tech.